Words of wisdom from United Playaz anti-violence coalition. A friend of mine and I recently co-led a poetry workshop with a group of 7th, 8th and 9th graders, all of whom qualified for the workshop because of coming from low-income backgrounds. As dictated by the program we were a part of, we met in hour long sessions three times a week, over a span of about five weeks. Each session consisted of first responding to a quote with a free write, then introducing a poem model, and finally by writing poems of our own in the form of that model, based on the original quote. At the end of each session, the kids had each written and been able to share a new piece of poetry. A few sessions into the workshop, we introduced a poem model in which the kids would each be writing letters to their own neighborhoods. Using quotes and asking questions which we thought to be neutral, we tried to encourage the kids to imagine what writing a letter to a personified form of their hoods would be like: How would you speak to your hood? What would you have to say? How would your hood respond? After we had read over and discussed the poem model together, each member of the workshop had about twenty minutes to write their own poems. We took the remainder of the period to share out what the kids had written. There were a total of twelve students in the class, ranging in age from twelve to fifteen. When we began to read out the poems for that day, we noticed that with very little variation, each student had written an almost uniform poem. The respective poem of every single student had portrayed their neighborhood as a sad and dangerous place, devoid of hope, where the people were going nowhere, and where nothing positive was happening. Every student included somewhere in their poem the desire for escape, their dream of leaving the hood behind, and specifically of evading the fate to which every other member of their community was inevitably tied. By the finish of the period, a heaviness had come over the entire room, brought on by both the intensity of the material being read, but also by the creative and intellectual blocks we could all tangibly feel ourselves coming up against. The bell rang and the students left silently. Outside the class, the co-leader and I put our heads together as soon as we had a moment to plan the next session. How had all the students come up with identical poems, based off what we thought to be a pretty general prompt? How had every student–all of them brown, all of them from poor and working backgrounds–found such a uniform vocabulary for describing their neighborhoods? How had they all been taught to feel and communicate in the same ways about where they came from? Was the source of these feelings located in themselves, their families, their communities, in media, in the program of which we were a part, or some combination? As we began to ask these questions of our students’ poems, we also began to ask them of ourselves and our own backgrounds. Where had we come from, and from what sources had we learned how we were supposed to feel about our backgrounds? Were we proud of our neighborhoods? Why? Where had we learned pride in our backgrounds? When, and from whom? We thought long and hard about the direction which we wanted our workshop to move in, and came up with a plan of attack for our next class. We opened the floor up for students to share their own interpretations of this quote, and as the conversation went, asked them some guiding questions: Who is this poet speaking to? What message is she trying to get across? When she says ‘white person,’ does she only mean white people? Does she mean all white people? What about when she uses the term ‘Black?’ Students offered solid and thoughtful responses to our questions, some of them agreeing with our own interpretations, others challenging them. We then asked all the students to take out their notebooks and flip back to the letter poems they had written in the previous class. We admitted to them that these poems had worried us and made us sad, and we wondered why everyone had spoken of their neighborhoods on almost exactly the same terms. One student spoke and said that her neighborhood was exactly as bad as she had described it, and that she had only been speaking the truth as she saw it. Several other students responded, and this was a point which we all had to think about. My co-leader offered up an anecdote about her own mother’s upbringing in housing projects in Chicago, bringing up all the fond memories she had of her childhood there, the games she used to play, the meals she loved to eat: “My mother used to say that she never knew she was poor. She had food, fun, a roof over her head and a family that loved her, and that’s all she needed. It wasn’t until she grew up and left her neighborhood that she learned that is was a ‘bad’ place to be from, that she was supposed to be ashamed of it. It’s not that there were no bad things about the projects,” she told our students, “it’s that there were good things, too. Everyone expected her to forget those good things once she left the projects, to only talk bad about them, but she never did. She never forgot.” A noticeable mood change came over the room as my co-leader said these words, and the student’s eyes were fixed on her as she spoke. We next asked the students to return to their notebooks, and to respond to this quote by rewriting their letter poems as a free write. This time we asked them to include the whole picture of their neighborhood–the things they loved, the things they hated, the things which annoyed them, the things that made them laugh, everything. As is the rule with every free write, the students’ pens had to keep moving for the entirety of the timed period, never coming off the page. Though we did not get to hear students share out their poems–which included incredible tributes to graffiti tags, friends who lived next door, and the piragua man, to name a few–until the end of class, the tone of the space and noticeably shifted. Not only were students writing furiously and passionately, but there was a new sense of trust, connectedness and risk as we continued forward with the lesson. By being honest with our students about the frustrations and worries which we were facing as teachers, they felt encouraged to put the same honesty into their poetry. And by showing them that we valued opening up the curriculum to student input and opinions, we encouraged them to value their own ideas in shaping perceptions about themselves and their communities. The risk we took as teachers paid off in the risks our students were willing to take as writer and intellectuals, and brought them closer not only to their own work, but to us as their teachers, and to one another as members of a creative collective. And perhaps most important of all, we all learned that the ways we are taught to imagine ourselves and our communities are not always accurate. By challenging the dominant conversation, and using our own imaginations–our own voices–to name our experiences, we learned to challenge the orders which tell us how to think, and got one step closer to finding the strength to empower our communities ourselves, rather than through the charity of our oppressors, or through the seduction of escape. Very good point. I grew up in the city of hartford many years ago. I also did not dwell on being poor. I had more good times than bad and I loved my neighborhood and friends who at times tortured me as well as loved me back. When people talk poorly about Hartford I always defend it from the strong point of actual experience. I remember when as a kid, I would see the news and hear conversations about gang violence and never witnessed any. Maybe I was lucky but we must always defend the good that out of necessity exist alongside the bad. Thank you very much for sharing this. Something we tried to talk about in the workshop with our kids was taking pride in our neighborhoods while holding close every aspect of those places–the good and the rough–just as you say. Where we originally hoped this conversation would lead, and where I think it can lead with enough time and reflection, is towards the idea that our hoods are not places that need to be defended as much as they are sites of struggle for the economic, social and political forces that are at battle in our current moment. We hoped that if a child were coming from a gang-ridden neighborhood, they would not move to deny or focus attention away from that reality, but rather to come to ask why their neighborhood was that way, who made it so, and how it could potentially look differently. 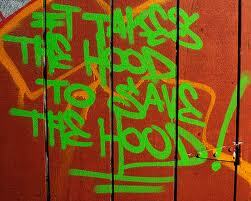 We believed that only by practicing love for our hoods could we come to look at them fully and critically. How successful we were at conveying this in one workshop is debatable. I can think of so many times at Wes where I engaged in this very behavior – a ritualistic demonstration – alongside classmates. Many of us thinking that we were being progressive when in reality we were not challenging ourselves at all. We were using the same old scripts; we were far more comfortable talking about how oppression had made us hate ourselves (or our hair, our bodies, our sexualities, etc) and where we came from (immigrant families, struggling communities, etc.) than talking about what it means to love ourselves and where we come from in the face of our oppressions. The truth is that many of us weren’t ONLY bogged down by the weight of oppression or full of self-loathing because of our positions as ‘other’, we just didn’t know how to talk about all the other stuff. We didn’t have a script ready for that and we weren’t always being encouraged to create new ones. Loving the blog and the work that you’re doing! Will definitely be linking to this. Word, I totally feel all of that. Thank you so much for your close reading, your generous thoughts and feedback!